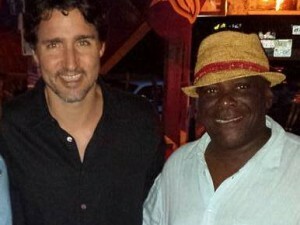 Basseterre, St. Kitts, January 08, 2016 (SKNIS)—As he flew back to the cold climes of Canada, Prime Minister of Canada, The Right Honourable Justin Trudeau, has returned with the warmth of the people of St. Kitts and Nevis and the memorable experiences of a wonderful private family holiday spent in the beautiful twin-island Federation of St. Kitts and Nevis. Departing the Robert Llewellyn Bradshaw International Airport in St. Kitts on Friday, January 8, Prime Minister Trudeau, his wife Sophie and his three children, Xavier, Ella-Grace and Hadrien, were bid farewell by Prime Minister of St. Kitts and Nevis, Dr. the Honourable Timothy Harris, and Minister of Foreign Affairs, the Honourable Mark Brantley. After a 10 day holiday on Nevis at an undisclosed location, Prime Minister Trudeau, 44, expressed to Prime Minister Harris and Minister Brantley that he had had a wonderful time in the Federation and will be back. 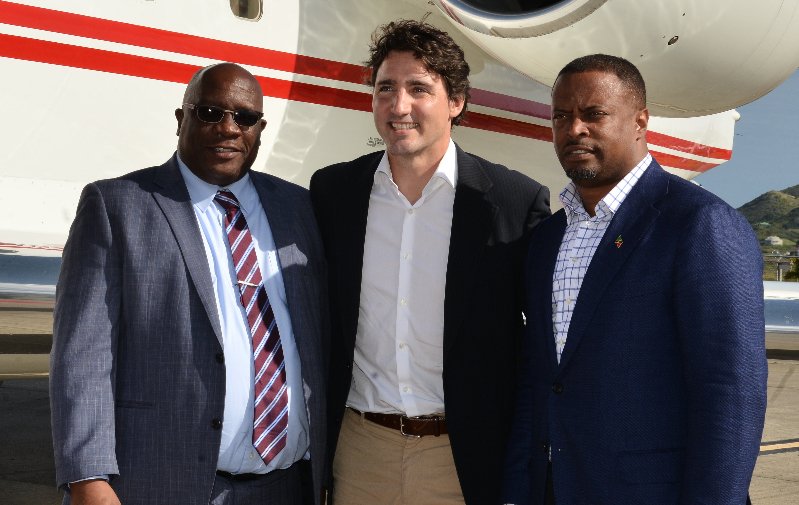 Both Prime Minister Harris and Minister Brantley underscored the strong relationship between St. Kitts and Nevis and Canada. “Canada is a longstanding ally of St. Kitts and Nevis and we feel that the fact that he chose St. Kitts and Nevis demonstrates that Canada is still a good friend and so for our purposes it is a good springboard to engage in further discussions with Canada as we try to deepen and widen our relationship,” Minister Brantley said. Prime Minister Harris echoed the same sentiment. “We are happy that of all the places he could have chosen, he chose St. Kitts and Nevis as his destination of preference. It shows that St. Kitts and Nevis is on the world map and when the discerning traveler wants to take a vacation, he or she chooses St. Kitts and Nevis,” Dr. Harris said. “It brings back fond memories of the long relationship that St. Kitts and Nevis has enjoyed with Canada and we are hoping that history will rebound again to stronger bilateral relationship between our two countries and peoples,” added Dr. Harris, contextualizing his statement in what he recalled as the “regrettable development” when St. Kitts and Nevis’ visa-free access was stripped by Canada in 2013 under the ousted Douglas Administration. Prime Minister Harris said that his government is trying to persuade the Canadian Government to restore the visa-free access to St. Kitts and Nevis as a number of reforms have been undertaken to restore the integrity of the Citizenship-by-Investment Programme. He said that he had spoken to Prime Minister Trudeau at the Commonwealth Heads of Government Meeting held in Malta in November of last year and also upon his arrival in St. Kitts and Nevis for his family vacation. Prime Minister Trudeau is the son of one of Canada’s most famous and influential prime ministers, Pierre Trudeau. He is the 23rd prime minister of Canada, having been sworn in on November 4, 2015.